Your dentures are an investment and require care and attention to maintain their optimum performance. The fit of your dentures will have a profound affect on your oral tissues and health. An annual examination by Dr. Lebowitz, Dr. Fialkoff & Dr. Sparks will help ensure your denture is functioning properly. Annual examinations can assist in detecting oral abnormalities including cancerous and pre-cancerous lesions. Early detection is the most important criteria for successful treatment. 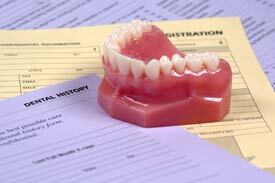 Ill-fitting dentures may cause bone and tissue changes and need to be corrected. Our practice can assess and recommend solutions to suit your personal needs. Bite problems, speech impediments and tissue irritations can be caused by an ill-fitting denture and should be remedied. Leaving this condition unchecked can lead to complicated situations in the future. Drs. Lebowitz, Fialkoff and Sparks can assess your dentures for cracks, chips, and broken or loose teeth and suggest solutions.